Like many others I wound up paying far more attention to the introduction of Caitlyn Jenner, via a Vanity Fair article and spread, last Monday, than I ever thought I would. I don't think I've ever seen a single episode of any reality show starring a Kardashian. And yet, there I was, crying into my coffee while reading a New York Post story about how the fashion world has embraced Jenner. She really looked quite elegant, and following hair, makeup and some Photoshop I'm sure, incredibly feminine. I've heard the comparisons to Janice Dickinson, but am I the only one who thought she resembled Kyra Sedgewick? 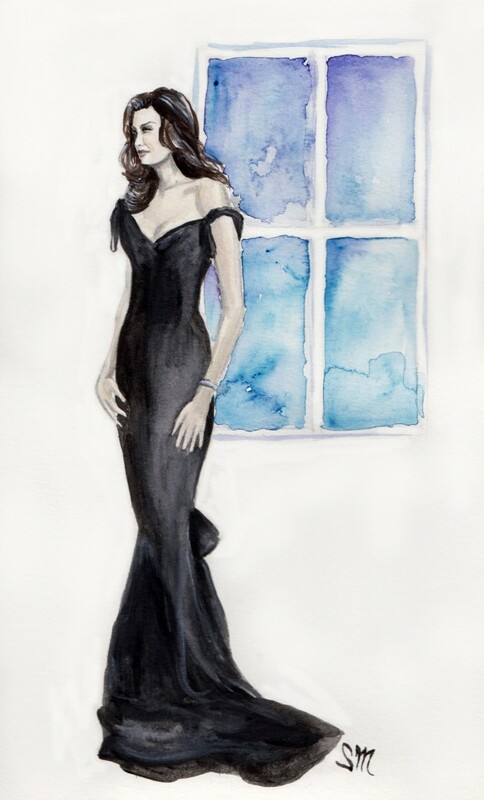 Anyway, without further ado, here's my latest illustration depicting one of Caitlyn's Vanity Fair shoot looks.